*We get to keep a larger portion of the sale via createspace. 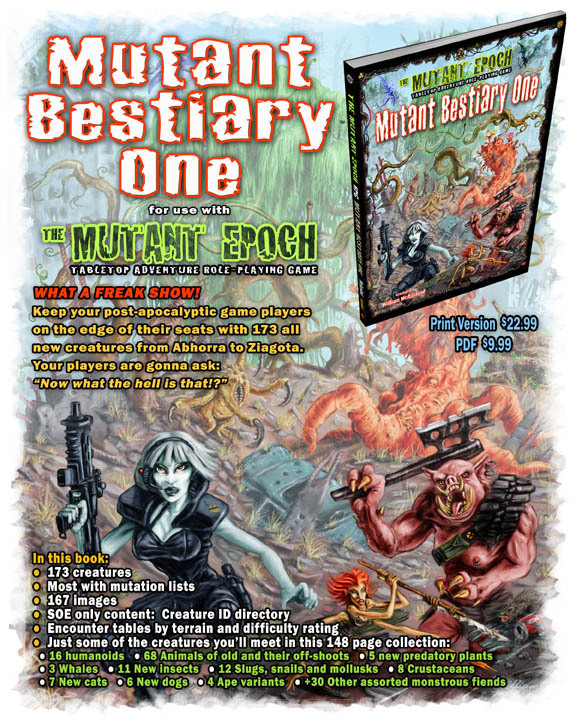 Have your Mutant Epoch players seen it all? Looking for more than the 104 monsters found in the hub rules book? Well this richly illustrated tome is the answer. Dive in and get ready to throw some surprises their way! 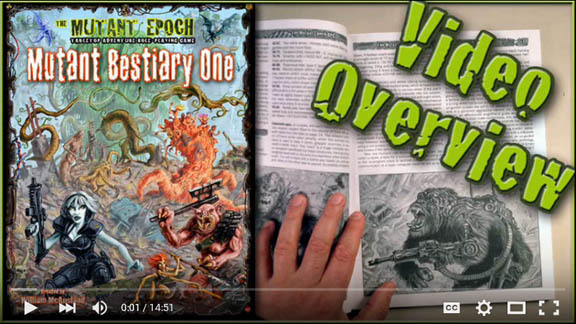 This is the seventh book in the Mutant Epoch role-playing game line, using the Outland System game mechanic. Of course, any GM can easily convert the stat blocks of these critters to another system. This collection of nasty freaks, from the blood mole to the earth shaking mobilamortus tree, will to challenge and intrigue excavators of low to high ranks. Also included are humanoid and bipedal specimens that can be played as new character types, if the GM allows it, including krenth cat-folk, diminutive devilkins, dog-boys, anthro-tortoises, bipedal raccoons and haughty, pale skinned underfoot. - 173 creatures, from animals such as sheep and deer ­- that often exhibit mutations - to terrifying off-shoots, predatory plants, bio-engineered organic weapons, and hyper evolving monsters of the wasteland, bog, ruins and reef. - The majority of these creatures have their own random mutation lists, so making up unique beasties is a cinch! - Encounter tables are broken down into terrain types as well as the difficulty ratings for low, mid and high rank character parties. - Each creature is depicted in either a group or individual illustration with a total of 167 images. 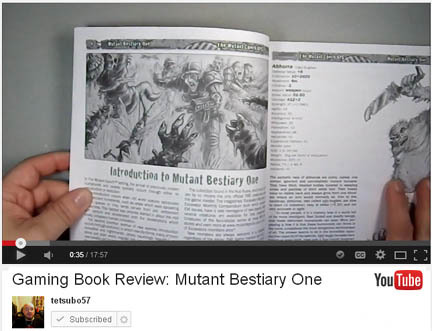 - PDF aspects: Fully bookmarked table of contents, clickable page number references both in creature descriptions as well as the extensive encounter tables at the back of the book. Preview link shows the first 8 pages of this 148 page book. Get your Preview here! 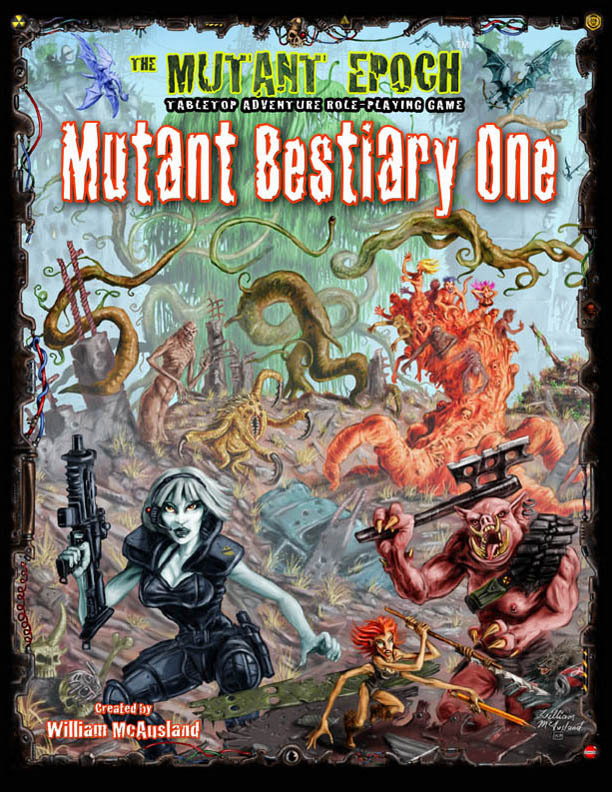 Visit The Mutant Bestiary One art gallery for an extensive, closer look at dozens of never before seen mutant freaks! These things are gonna kill adventurers, so have plenty of new character sheets on hand.